451 Research recently surveyed 4,022 North American consumers on their attitudes and preferences toward digital wallets. 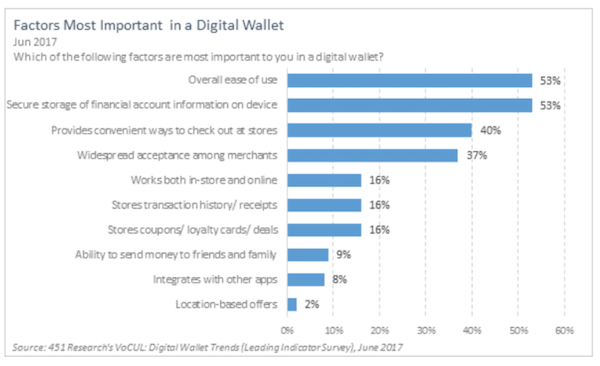 "Secure storage of financial account information" (53%) and "overall ease of use" (53%) tied as the most important factors in using a digital wallet. "Convenient ways to check out at stores" (40%) has edged ahead of "widespread acceptance among merchants" (37%) as an important factor. Consumers have concerns about the security of digital wallets versus credit cards. While a total of 29% believe digital wallets are more secure than traditional credit cards, another 29% still say they're less secure. According to Jordan McKee, 451 Research's principal analyst, "security concerns continue to run rampant in the digital wallet ecosystem. Until providers make a concerted effort to dispel misconceptions, consumer take-up will be throttled." Looking at security perceptions by OS and Apple iOS users (35%) remain more likely to say digital wallets are more secure than Android owners (21%). Half (51%) of respondents say they're unlikely to use digital wallets over the next 90 days. Respondents were asked what would drive them to adopt digital wallets. The top choice by far is "security against fraud that is better than traditional payment cards" (59%). More than one-quarter (28%) want to receive discounted offers, while 21% would use them for faster checkout time. Originally published on 451 Alliance. Members enjoy exclusive insights into industry trends in cybersecurity, cloud, digital infrastructure, the internet of things, and emerging technologies.